SARAH'S BLOG OF FUN: Today Is National Clean Your Refrigerator Day!! 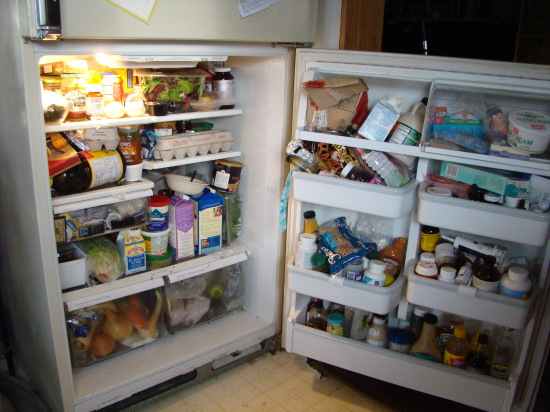 Today Is National Clean Your Refrigerator Day!! If your Fridge looks like this (no that is not mine!!!) It's time to clean house!! Remember that Turkey Day is next week!! You know you need the space!!! "What's that in the back of the refrigerator!? I don't want to find out. Don't open it...... the odor may overwhelm you!!! Hold your breath, scrunch your nose if you must, and get to the task. Everything in your refrigerator was once a fresh, healthy food, ready for your consumption. It may have been a tasty leftover, intended for later enjoyment. Unfortunately, over the course of weeks or more, things get pushed to the back of the refrigerator and slowly transform into something impossible to identify. We've all run across items in the refrigerator that once were tasty food, But, now, they are some dried out, mold covered nasty, that you remove and dispose of at arms length. Who wins the prize for the worst refrigerator surprises? Most often, it's workplace refrigerators. Use this day to clean out your refrigerator, top to bottom. When it comes to food safety, we fall back to the old saying " When in doubt, throw it out!""